Although we do consider it mildly ironic that videos have lately become such a powerful force in book promotion (videos and books just don’t seem like natural allies to us), we cannot deny that we love watching book trailers. When Mary Newell DePalma sent us a link to the book trailer she had posted to YouTube for Uh-Oh!, we were immediately enchanted by the way it brought the art, story, and spirit of the book to life. What’s more, after watching it a few (dozen) times and trolling YouTube for more representative samples of the genre, we began to think to ourselves: we can do that! Why not? Inspired, we started poring over EBYR’s latest announcement catalog, looking for a picture book that stood out for its cinematic possibilities. We quickly agreed that, with Eileen Spinelli’s deft storytelling and Giuliano Ferri’s luminous artwork (not to mention a lovable main character in gentle Whale), Jonah’s Whale was the perfect choice for our first in-house book trailer. With our subject chosen, we got right down to business, selecting artwork and sound clips, finding a willing narrator, and reworking portions of the text into a manageable script. Then our indefatigable Internet marketing assistant Becki Watson set about the serious work (or as she calls it, “fun”) of putting all the pieces together into a coherent whole. The fruit of Becki’s labor (or as she calls it, “play”) you can see below. Enjoy! Now that you’ve seen it, please let us know: what do you think of our first in-house book trailer? We’d love to hear your thoughts. We’d also love to know which other Eerdmans books (for adults or young readers) you think would translate well into book trailers. 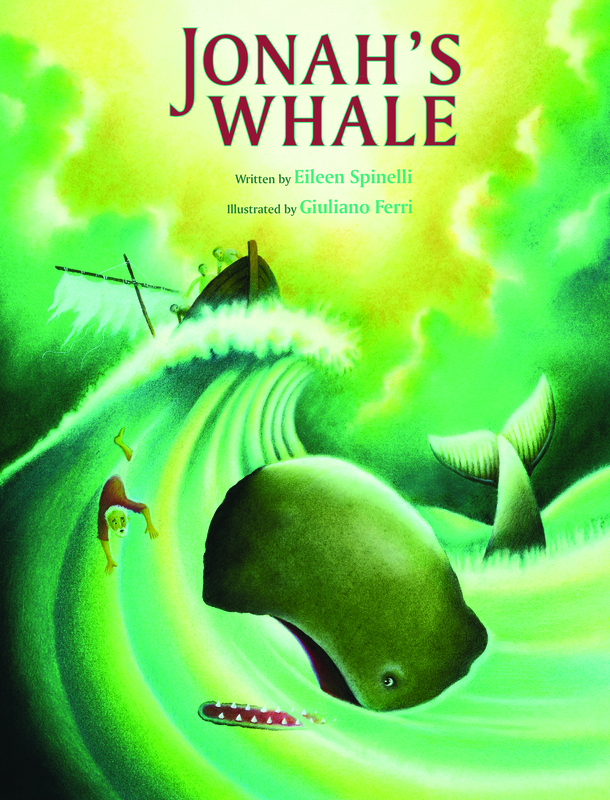 Click here to order Jonah’s Whale, written by Eileen Spinelli and illustrated by Giuliano Ferri. The narrative sound quality was a little poor. Thanks for your feedback! We’ll see what we can do to enhance the recording quality next time. That was quite a nice piece! The only thing better would have been if it were read by Eileen herself. I longed to hear her voice, the grandmother voice reading to her little ones. I mean no disrespect, but the narrator’s voice was a bit too ponderous for me. In any case, your trailer lures me to read “the rest of the story”! Thanks for this ingenious picture book promotion. Enjoyed the book. Thank You for Sharing . A well-written version of this story. I enjoyed the background music and sound effects but am not a fan of the narration. It sounded like he was speaking in a drum and his pacing was poor. On the whole, an uninspiring narration. Beautiful illustrations! If it’s not crass to self-nominate, and if you’re really seeking suggestions for other titles to experiment with, I think this narrator/narration style could work really well for Tillmon County Fire. From what I hear, teens may be more into the book trailer scene than picture-book readers. Whatever books you select, kudos on entering this new arena! We’ll certainly take it into consideration, Pamela. Thanks for the suggestion! A dramatic reading, beautiful colors, visually exciting, terrific sound effects! The narrator is not overly dramatic for me, made me think it was James Earl Jones. All the components worked for me.